Northern Ireland's Alastair Seeley is the early leader in the British Supersport Championship after winning Monday's race at Brands Hatch. Seeley, last year's championship runner-up and now riding for Mar-Train Racing, saw off Graham Gowland in a thrilling race at the Kent circuit. 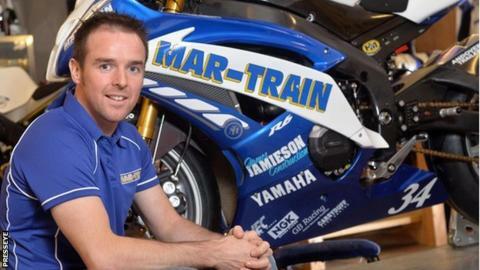 On Sunday, Seeley had come third in a race won by fellow Carrickfergus man Glenn Irwin. After the first round of races, Seeley leads the championship by five points . Irwin, who took over the Gearlink Kawasaki ride after Seeley's move to Northern Ireland team Mar-Train, is in second place after finishing fifth in Monday's event. "It was a typical Supersport race - hectic from start to finish," said 34-year-old Seeley who overtook Gowland and Billy McConnell to move from third to first in two corners in lap 11. "I managed to get in front and just put the laps down. "It has been a really good weekend for us, good lap times, and roll on Oulton Park." Irwin earned his maiden British Supersport win in tricky conditions on Sunday, winning the 18-lap Sprint race from Luke Jones and Seeley who came through from the fifth row on the grid. In Superbike race one, won by Shane Byrne, Clogher's Keith Farmer was out of the points in 19th on his PR Kawasaki, with Michael Dunlop 24th on his Buildbase BMW. Farmer finished in the same position in the second race, with Dunlop, who was nursing a sore shoulder after a heavy tumble in qualifying on Sunday, failing to finish. Marty Nutt took fourth and fifth places as he began the defence of his Ducati Challenge crown.